Ah, the iPhone 6s. Apple’s latest upcoming device has got everyone interested on what this year’s smartphone upgrade will bring with it. Such anticipation and hype around its products is Apple’s own doing, as the Cupertino giant has touted the mantra of innovation and change ever since its foundation, and continues to do so with every hardware or software release. Last year’s generational upgrade for the iPhone didn’t see any major innovations from Apple. Instead, the Cupertino company decided to cater towards market demands directly, and went forward in releasing the 4.7-inch iPhone 6, and for the first time in Apple’s history, a phablet was released in the form of the 5.5-inch iPhone 6 Plus. The iPhone 6 and the iPhone 6 Plus also saw a complete design overhaul over the iPhone 5s, a mandatory processor upgrade, some camera changes and optical image stabilization being added to the larger of the two devices. But in terms of features and functionality, there was really nothing new on Apple’s behalf, aside from Apple Pay, which aided the company in adding another service to its roster. So will the iPhone 6s and iPhone 6s Plus add on to where its predecessors failed to deliver? We’ve been hearing nearly countless rumors, speculations and more on the upcoming device, so let’s take a look at what can be expected to change this year. Force Touch made its big debut with the Apple Watch, allowing users to invoke different actions by pressing down hard on the display, and any talk about the iPhone 6s and iPhone 6s Plus is absolutely incomplete without a slight mention of Force Touch technology. As far as new features go, a Force Touch display on an iPhone is a big step towards adding to the device’s overall functionality. Not only will it give users more control over the way they use their iPhones, it will also end up opening a variety of new horizons for developers who’ll be free to design and create great new apps that’ll utilize this feature. In fact, the rumor regarding Force Touch technology making its way to the iPhone 6s is one of the oldest one out there. The earliest Force Touch mention for the iPhone 6s was seen way back in January. Back then, not only was Apple’s upcoming device said to come with Force Touch, but 2 GB of DDR4 RAM as well. While we’ll be getting into performance specifications later on, if there’s one thing that should be almost confirmed for the upcoming devices, it’s Force Touch. According to some past rumors, Force Touch is something that won’t make its way to both the iPhone 6s and iPhone 6s Plus. We saw some reports surface which claimed that Apple would only be introducing the new Force Touch panel in the iPhone 6s Plus, in a bid to differentiate the device, or simply to test it out on a limited scale. But later on, we learned that perhaps cost was the primary constraint on Apple’s mind, with Force Touch panels priced nearly three times as much as regular display panels. But before you get your hopes up too high, we’ve seen some reports that contradict Force Touch on the iPhone 6s duo as well, the most important of these can be seen above. 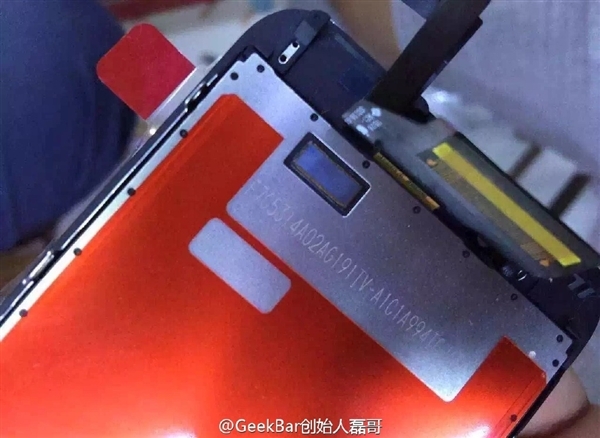 Just a week back, we saw GeekBar post what they claimed were images of a fully assembled iPhone 6s display. When compared to the current iPhone 6 model, the assembly showcased little changes, which can mean three things really; either the images aren’t real, they aren’t fully assembled, or for the worst, there won’t be any Force Touch this time at all. Coming back towards the positive side however, Apple’s supplier has also reportedly sped up Force Touch shipments for the iPhone 6s duo. At the start of August, Force Touch panels reportedly entered mass production and Apple’s suppliers expect a good 230 million units of the iPhone 6s to ship this year. Apple’s really confident this time around, and with good reason too; the iPhone 6 and iPhone 6 Plus were a huge success and Cupertino saw record revenues in its latest quarter.